There are three ways to manage collections of codified knowledge - collection, collation and synthesis. We can illustrate this by looking at lesson learned systems. Imagine your organisation has been documenting lessons from projects for years, and storing the documented lessons in project reports and project files. The first step is to collect the lessons and to store them in one place, such as a lessons database or lessons folder. This is significantly more convenient than leaving them in project files, as there now becomes one place to go to find lessons, rather than having to open each project report in turn. However by the time there are 1000 lessons in the database, it becomes a real chore to find anything of value. The second step is to curate the lessons. 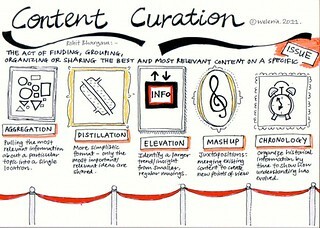 As the diagram here suggests, curation involves different ways of selecting and displaying content; high-grading the important lessons and giving them prominence, grouping similar lessons together, removing duplicates, and so on. This makes it easier for people to find the most relevant and most important lessons. However the user still needs to look through the lessons one by one. The third step is to synthesise the lessons. This involves taking the knowledge from the lessons, and combining it into guidance. Imagine you have 50 lessons on project scoping - you extract the key content from the lessons and build guidelines on project scoping. Then, as new project scoping lessons are identified, the guidelines can be continuously updated and improved. The user then only needs to look at the guidelines, which will contain the synthesised knowledge.